The greatest difficulty this small campsite could ever encounter is living up to its name. After all, those two simple words, ‘secret’ and ‘garden’, when put together, promise so much: your very own slice of Eden-like paradise full of natural pleasure. 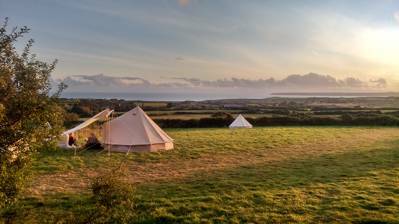 The fact that this tiny campsite is situated on the mystical far-western edge of Cornwall, where travellers only find what they earnestly seek and don’t just drop in by chance, only adds to the anticipation and allure of the Utopian vision. And the way to the Secret Garden is indeed enchanting, along the rugged coast westwards, fleeing the crowds of St Ives, or across the empty granite-strewn hills, escaping any Pirates of Penzance. Bosavern House doesn’t look like a place where there is, or can be, a campsite. Instead, it’s a rather grand-looking granite mansion. ‘Where’s the campsite?’, you ask the distinguished-looking chap who comes to the door. ‘It’s in the garden round the back’, says he, and your heart dares to wonder if all those wild imaginings of a secret garden can really be true. Then, when reality sets in as you push past the hens, brush off the embrace of the palm trees and other exotic plants, there it is – the Secret Garden. 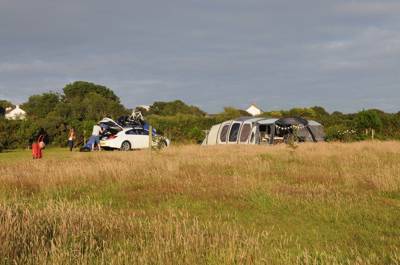 But what’s this – other campers in the form of two tents and two campervans? So you aren’t the first campers to make it here after all. Drat. In fact, there are 12 pitches within this lovely little oasis of vegetational tranquillity, and quite often in high season they are all occupied. However, though it may not be solely yours, after a day or three has passed and the outside world is just a distant memory, the realisation dawns that this garden campsite, with all its hidden-away intimacy, really feels like a secret – and a perfect one at that. The onsite facilities are spotlessly maintained, and there are pleasingly homely touches, with the lounge in the main house open for campers’ use, alongside the library and bar. The feeling that you’ve happened upon a secret location endures once you step outside, where little-trod footpaths lead off towards the coast. One such magical trail leads to Porth Nanven, through a mile of scenery that you never want to end, to yet another seemingly undisclosed place, despite being just a few miles from the tourist throng at Land’s End. Another footpath strikes out across farmland, before burrowing its way through dark, damp, overgrown tree-tunnels to the cliffs, and to Cape Cornwall: one more well-kept secret. It’s fortunate the Cape doesn’t poke out into the Atlantic just a little further, or it would have been Land’s End, and this beautiful, empty place might have ended up being smothered by visitor footfall. As it is, you can stroll here from your Secret Garden, enjoy a swim in the cove or tidal pool, climb to a lookout to see if you can spot a basking shark, watch the fishermen winch their boats out of the sea, then wander back to the campsite for a laze in the garden... And all without encountering more than a handful of other retiring and secretive folk. This campsite was an absolute pleasure to stay at. Such friendly people, we felt really at home and nothing was too much trouble. We are definitely going to return. I have grown up coming here and it never disappoints! A lovely, quiet campsite with just 12 pitches makes for an ideal holiday. The campsite offers a brilliant base for some great adventures, walking along the coastal path to Lands End, near to some great surf at Sennen Cove, lovely walk into St Just village and lots of lovely beaches and coves to explore. The campsite is perfectly equipped with freezer, washing facilities and clean toilets and hot showers - always a necessity after being in the sea. This campsite is family friendly, despite going off to Uni I have always tried to head down for the annual trip with family and friends, and is definitely the holiday highlight of the year. 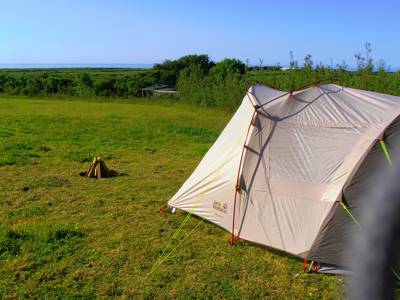 This is a great campsite if you are up for an adventure around the Cornish coast with a perfect, peaceful place to come back to of an evening. Definitely the nicest campsite I have been to, it has set my standards very high - probably the reason I keep going back! We have enjoyed a week in May at the secret garden for many years with our friends. Come rain or shine we love this week and have always been very welcome. There are only 12 pitches but that is the beauty of it as it is never too busy. The shower and facilities are always clean and there is always hot water. We have pitches together so can easily spread out and put up the porch or gazebo if it's raining. There is a little farm shop next door and we enjoy the walk across the fields into St. Just for a beer and Cornish pasty. We have spent many wonderful days at Sennen and returned to the site for a BBQ in the evening. Have lost count of how many years we have been but it must be at least 12......the children are grown up now but always make a special effort to join us for a few days from uni. even if it's only for a couple of days. We all love this holiday and spend the rest of the year talking about it or looking forward to it. Fingers crossed for sunshine this year....... Can't wait! We've been camping at Bosavern Secret Garden since 2003 and we love coming back - it's our favourite week of the year. The site is perfect - just 12 pitches, with excellent facilities and easy access to some of Cornwall's finest beaches and great coastal walks. 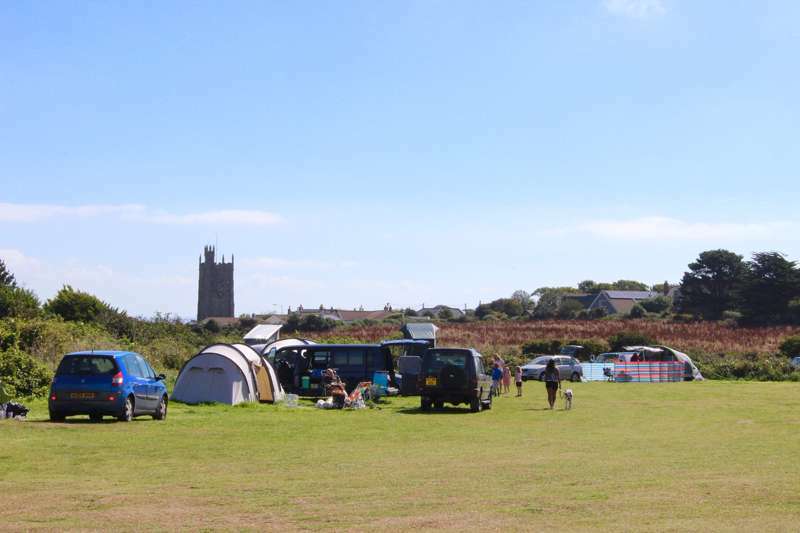 St Just is within a 15-20 minute walk - or longer if you take in the views out to sea; and offers everything you need for whatever you're doing - picnic on the beach, barbecue at the camp-site or quality pub food. Corinne and Allen are ideal hosts, very welcoming - even when we're early, there when you need them and happy to let you enjoy your holiday. The site is child friendly - helping to feed the chickens is great fun, and the facilities at the house are available to campers. if you are after stress-free camping with space to live outside your tent, access to great beaches and beautiful scenery, then you'll love Secret Garden. Stayed here a week ago and was really excited as the reviews were so good but were very disappointed on a number of accounts. Firstly, we arrived at 1.25pm and were greeted by the lady owner who wasn't at all happy that we were 35 mins early. We were then led to our spot and then pitched having been told to be 1 metre from the marker. We pitched making sure the tent and van were within 1metre of said markers but when finished were confronted with a loud 'Oh, no, that just won't do', as our guide rope was less than 1m (I'm talking 200mm) closer to the marker but still 2m from the next tent! The conversation then went along the lines of 'we had to fix it if we were to stay'. We reduced the size by getting rid of the front annex of the tent which meant we couldn't sit under the awning when it rained but that still wasn't completely right so I had to point out the neighbours guide ropes (not tents) were also less than 1m from their side of the marker. "It will have to do!' came the reply as she walked off! It did ruin the day and we were so put off by our greeting that we left a day early. When speaking to our neighbours on site they had also experienced the same dilemma and greeting over their early arrival and had been forced to move pitches after one night to fit within the markers. We camp at numerous locations every year and have never once encountered this situation. The camp site is nice, though very small and no real space for kids to play and maybe we arrived, as did our neighbours, when the owner was having a bad day but had an apology followed then there would be no need for this rating. It never came. Thank you for your review, Mr P. Achieving a balance between arriving and departing guests is always a difficult one. We find that many guests need the whole morning to pack up for departure which means we cannot start the daily campsite cleaning and other duties until lunchtime. For this reason, we specifically ask all new guests not to arrive before 2pm. We are sorry your early arrival was not welcomed in an appropriate way. We also don’t enjoy having to be so careful about the gaps between our pitches but we are obliged to maintain firebreaks under instruction from the fire service. All guests are advised of the maximum allowable footprint for their unit – which includes all guy ropes – before they book and again in the formal reservation confirmation. If the combined van, awning and guy ropes are within the 8m x 4m footprint they will easily fit on the pitch lengthwise but not across it. Whilst it is tempting to spread into an adjoining pitch, this is clearly unfair on those guests who have paid for it and are not present when you arrive. We agree we had missed the fact that another unit had not been correctly positioned. Your camping neighbours chose to move to another pitch (of exactly the same size) because they wished to stay an extra night. We were very happy to be able to accommodate their request. Finally, we welcome children but have no special play facilities for them. Really lovely peaceful site with wonderful facilities and very welcoming owners. Great base for exploring the far west of Cornwall which boasts some beautiful scenery and lovely beaches. Cream teas on site are delicious! My wife and I have just returned from a weeks stay at the Secret Garden in our Motorhome. What a lovely little site this is. Only 12 pitches, if you are looking for a nice peaceful & relaxing site this is it. The owners spend great pride in their site. Facilities were always kept clean and although there is only one ladies and one gents shower we never had a problem. There is two toilets for ladies, and one for the gents. There is an indoor pot washing area, washing machine, tumble dryer, freezer, microwave, iron and ironing board, rotary clothes line. There is also plenty of information about the surrounding area. You can walk to St Just across the fields about 10-15 minute walk, also some beautiful coastal walks with stunning scenery. Would highly recommend this site. Stayed here for 3 nights at the end of August. Fab little location, facilities really clean and warm showers. We arrived in our VW Campervan, made to feel very welcome by the owners. The walk into St Just is wonderful, with fantastic views, lovely little town with a great butchers for BBQ's and some nice pubs. The site is well placed to visit the great beaches, we will definitely be returning next year, kids loved feeding the chickens and the cream teas are certainly worth a try. Stunning local walks to Botallick Mines and the Queens Arms, across the fields into St Just and down Cot Valley to the Coast. Slightly further walks from Sennen Cove to Lands End and st Just to Cape Cornwall were awesome. St Just, a strange grey granite small town which we liked more each day - The Commercial had great beer garden and delicious food, shops open till 10pm! Secret Garden, St. Just, Cornwall. Love it here. Been for last 5 years...my 11 year old refuses to stay anywhere else! Small, secluded, no noisy clubs...just good old fashioned camping, the way it used to be. The house is beautiful and you are made welcome in there any time for a drink, game, telly or whatever. Set in the most beautiful area, near to the best beach...what more could you want? EXCELLENT!! 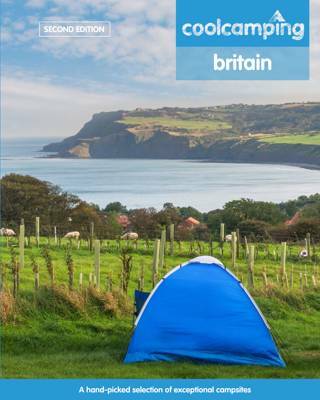 Tents, campervans, caravans – yes. Dogs, groups – no. There are many remnants of Cornwall’s mining heritage scattered about on both the moors and cliffs hereabouts. The Levant Engine House (01736 786156) – a very beautiful 4-mile walk along the coast path from the Secret Garden – contains a functioning Cornish Beam engine, which is in steam several times a week in summer. About 4 miles in the opposite direction is Sennen Cove, with its stunning beach and serious surf action, while a bit closer to the site (a mile away) is Porth Nanven, where a bracing dip awaits the adventurous. Just beyond Sennen Cove lies Land’s End, with its dramatic cliffs, breathtaking views, and collection of attractions. Less than a mile from the Secret Garden is Land’s End Airport, where there are pleasure flights and regular flights to the Scilly Isles. The Scillonian is operated by the same company as the flights, and sails to the Scilly Isles from Penzance. Between St Just and Penzance are the exotic (and slightly secretive) gardens at Trengwainton (01736 363148), where plants that grow nowhere else in Britain thrive in the walled garden. Local pubs in St Just (½ mile) include the Commercial Hotel (01736 788455) where the food is unquestionably good; the Star (01736 788767) – an ancient, atmospheric inn with no food; and the Wellington Hotel (01736 787319), which might be described as decently predictable. The Queens Arms (01736 788318) at Botallack, another mile down the road, is also fairly ordinary in the food department, but has a good selection of local ales and hosts a Beer Festival every September. For that extra-special treat, the Victoria Inn (01736 710309) at Perranuthnoe is a bit further away, but the contemporary food is as remarkable as the ancient surroundings. Follow the A30 towards Land’s End, and turn right on to the B3306 after passing Crows An Wra. Bosavern House, and its Secret Garden, is on the right after 2 miles. The summer-only Coast Bus operated by First from late May until early September can be boarded at Penzance (where there’s a train station) and passes the site. It’s also useful to reach walking expeditions on the coast path. There is also a regular bus service between Penzance and St Just, which is about 15 minutes' walk from the site.